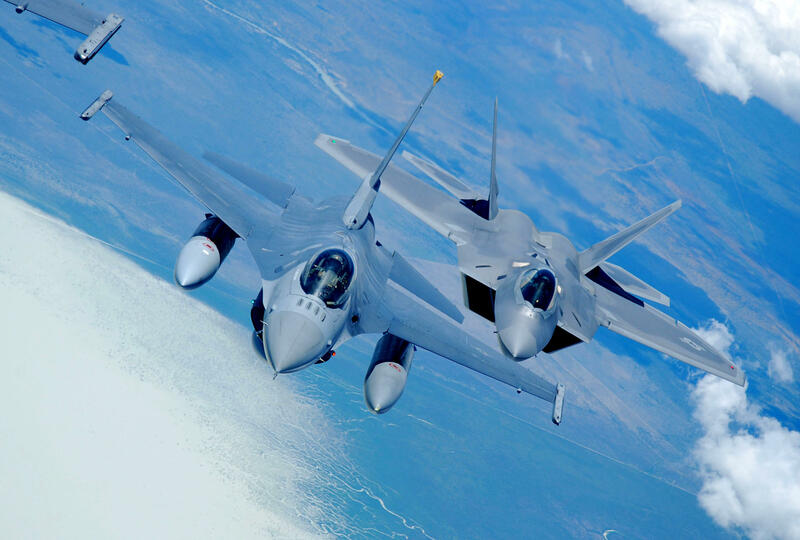 An F-16 Fighting Falcon, representing Misawa Air Base, Japan, demonstration team, and an F-22 Raptor, representing Langley Air Base, Virginia, demonstration team, fly in Australia airspace while heading for the Avalon Airport on Feb. 22, 2013. The Australian International Airshow 2013 is one of the largest, biennial international trade shows in the Pacific and is expected to draw over 350,000 visitors and features approximately 500 defense exhibitors from 35 countries. The Australian International Air Show wrapped up on Sunday at Avalon Airport outside of Melbourne, and featured fly-bys of Australia’s newest military planes including the F-35A fighter, and one of its oldest. The last day of the air show featured a heritage flight, so spectators who braved near record heat saw a British Spitfire, an American Mustang and the Australian built Boomerang. Just 250 of those fighters were manufactured and it was the last combat plane designed and built in Australia . . . until now. As many as half a dozen of these sidekick drones would accompany a manned aircraft, which could send them on high-risk missions. For example, drones could fly ahead of strike aircraft to identify threats on the ground or jam radars. It’s not known if the drone will carry weapons. The governments of Fiji and Vanuatu are having second thoughts about projects funded by China. In Port Vila, the National Convention Center appears to be a white elephant, while Fiji is considering charges against a Chinese resort developer. Denny Tamaki, the governor of Okinawa, plans to meet with Prime Minister Shinzo Abe as soon as this Friday, to present him with the results of this past weekend’s referendum. 72-percent on Okinawa voted against a long-standing plan to relocate a U.S. Marine air base. The referendum is non-binding, but the decision to go ahead with construction may have repercussions.